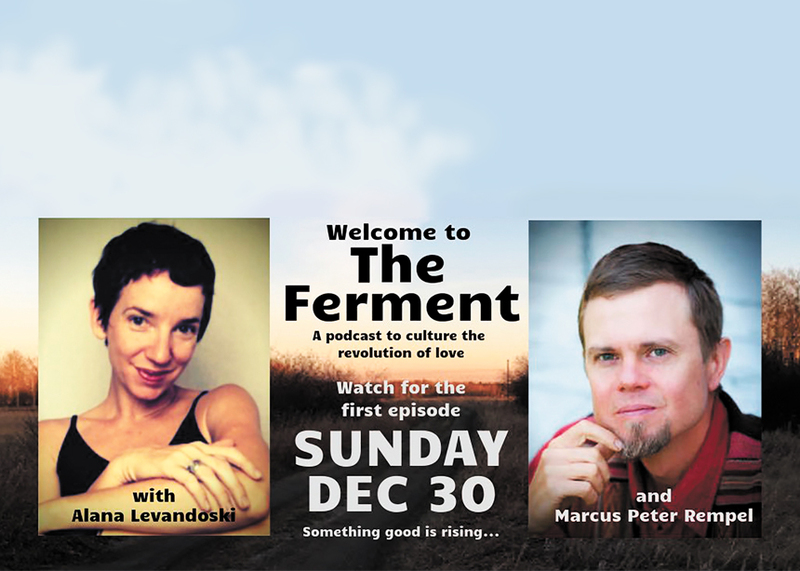 Musician Alana Levandoski and author Marcus Peter Rempel co-host the new podcast, The Ferment. At his home on Ploughshares Community Farm in South St. Ouen’s, Man., Marcus Peter Rempel chops a lot of cabbage. But, instead of making a salad or throwing it in a soup, he squishes it in a giant bucket, covers it and lets it sit at room temperature for several weeks. He lets it ferment, a step required to make sauerkraut. This is one of the inspirations behind The Ferment, a new podcast that Rempel co-hosts with Manitoba musician Alana Levandoski. The fermentation process could not be more different than that of canning, which requires complete sterilization. “It’s alive with something healthy that makes it good and safe and transforms it into something . . . [with] even more life and health for you in the food than there was to begin with,” says Rempel. Fermentation creates the conditions for a good culture to grow and thrive. The two creators hope their podcast can do the same. A multi-talented creator, Rempel is the author of Life at the End of Us Versus Them: Cross Culture Stories and has worked as an occupational therapist, pastor and gardener, to name just a few. The son of Mennonite mission workers, he is currently studying for his master’s degree in marriage and family therapy, and working at the Sandy-Saulteaux Spiritual Centre. Levandoski worked in the music industry for 10 years, writing with folk icons like Sylvia Tyson, recording and performing internationally. She now writes and performs songs and chants rooted in the Christian tradition and lives with her family near Riding Mountain National Park, where they’re exploring sustainable farming. 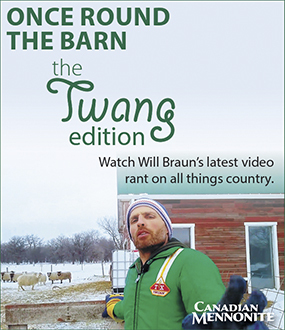 The self-described “farmer philosopher” and “mystic folkie” have so far released five episodes, including interviews with CBC personality David Cayley and two gay clergy, Tim Otto and James Alison, as well as a live recording of one of Levandoski’s concerts. Each episode includes an introduction by the co-hosts, a conversation with a guest and Levandoski’s music, selected to complement the conversation. 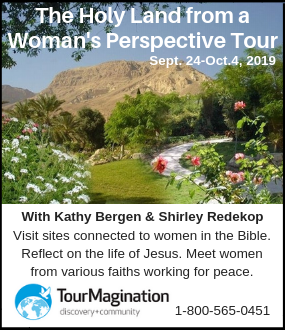 Upcoming episodes feature other big names, such as author and theologian Jonathan Wilson-Hartgrove, prominent peace activist Kathy Kelly, award-winning musician Steve Bell, and many others. Rempel first considered doing a podcast while writing his book, which created connections with people who were previously only names on the spines of his favourite books. He was eager to open up the conversation to other voices after it was published. The co-hosts first met at the Refreshing Winds conference held at Canadian Mennonite University. When a friend shared Rempel’s Kickstarter campaign for his book on Levandoski’s Facebook feed, she became one of its first contributors. The Ferment was officially born in 2017, when Levandoski played a concert at a tiny church in Rempel’s rural community and stayed at his home on the farm. Over breakfast in the straw-bale house, they exchanged ideas and the project was formed. Producer Samantha Klassen and web manager Matt Wiebe joined the project later, completing the team. We’re living in a time of cultural unrest, when fear whispers in our ears, and “us versus them” language runs rampant, says Rempel. “He has this sense in which the gospel, as a kind of bubbling, subversive yeast of the kingdom . . . ends up really overturning a social order that’s basically a social order of us versus them,” says Rempel. People are living in a time when those holding positions of power and oppression are being challenged, and new opportunities are emerging, but this new era needs to be powered by a force of love, says Rempel. He points to Bruce Cockburn’s famous lyric, “Got to kick at the darkness till it bleeds daylight,” and says, “If we’re just kicking at the darkness, I’m not sure that’s how the daylight breaks. There’s another kind of energy that’s not a kicking energy, that’s a wakefulness energy.” This energy, much like nature’s metaphor of fermentation, teaches people not to get stuck in one way of thinking, he concludes. The Ferment invites people to rethink how they live out love and grow friendship. Join the conversation at theferment.ca or subscribe on iTunes. I am loving The Ferment - especially the James Allison ep. Keep up the good work.